You don’t sound that old. At least you don’t act it. One good thing for you seniors is this year there will be more people over 65 than under 15. Should make someone sit up and take notice. I would like to have one of those shoe devices just to be on the safe side. But as far as your younger sisters are concerned, I think they should be thankful that they still have their teeth, long or short doesn’t matter. Thanks for another great rant. If I hadn’t read your blog, I would have gone the entire day not knowing it was national seniors day. Hey Blanche! Thanks for your comment. And now that you know it’s senior’s day, you might want to go out and get one of those 2 for 1 dinners. Oops! Too bad for you – you missed it. You need to line up at 4:00pm for the daily senior specials and it’s now 5:10pm. Better luck next year! 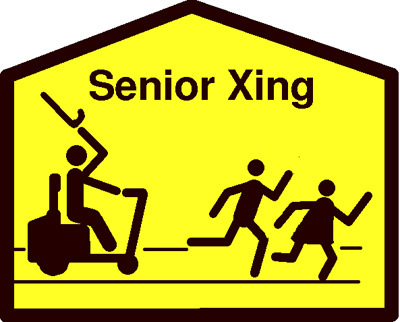 It is truly sad that a special day must be declared to honor seniors. When I first heard about the proclamation of seniors day, I ignored it. Most of the country has also ignored this day. 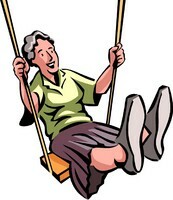 Unlike Mothers Day when almost everyone wishes me a happy Mothers Day (regardless of whether there is any indication that I was ever a parent), not one person at my gym or at a coffee shop frequented my many older people made any reference to seniors day. My white hair and wrinkles obviously put me into the category of ‘senior’ yet nobody took note. Seniors day needs a good marketing campaign to make it rock – although I would surely regurgitate my breakfast if it were a day accompanied with ‘Happy Seniors Day’ cards! You make a good point Jeanette. Not a greeting card I’d like to receive either. I think this “senior’s day” is unknown to most people. In my opinion, it is simply a manufactured day to assuage the guilt of many politicians – and the well-meaning but ineffective organizations who put ineffective but well-meaning programs in place, which are hampered by ineffective and not-always well-meaning bureaucrats…which brings me back to the politicians. Thanks for checking in Jeanette. Like Blanche, I too, did not know it was national senior’s day. I’ll have to take advantage of 2 for l dinners next year…if I remember! I guess we “baby boomers” have a chance to change things for the better simply because of our numbers. I love reading your blogs! Thanks for your comment J.J. I’m glad you’re enjoying my blog. We seniors need to shout it out as much as we can. I want some of those shoes! I have been married almost 40 years to the same man. Your description of older men nailed it. Thanks for the giggle, Pat. Thanks for your comment Robin. I’ll let you know when I’m taking orders for the shoes. In the meantime, I hope your feet are healing well and you’re feeling better. Cheers! If I may bastardize a quote by W.C. Fields, “Young men are like elephants. I like to look at em’, but I wouldn’t want to own one.” Caveat emptor on that one Rosy! Thanks for your comment. Makes total sense. Thanks for clearing that up.